Treadmills & Makeup… A NO NO! Treadmills & Makeup & how they dont mix! Ladies before you hit the gym or participate in any activity that will cause you to sweat…please remove all makeup! It’s not healthy for your skin! Working out with “your face on” will cause blemishes and unnecessary breakouts & you dont want that! 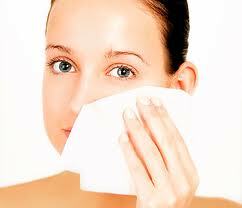 Simply remove ALL makeup before heading to the gym…wash your face or use a makeup remover wipe! It’s as simple as that! If you feel like you need to have a little something on put on a little lip gloss and mascara to spruce up your face!